Full of prayerful intensity! The devotional anthem My Eternal King expresses our love for Jesus as a reflection of His undying love for us. The solid, harmonic choral writing with beautiful a cappella sections interspersed with keyboard accompaniment provides the basis for an anthem rich in intense emotion and reverence. The vibrant full orchestration on P/A CD makes this an accessible anthem for both large and small choirs. 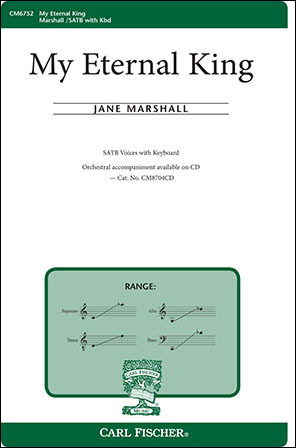 Jane Marshall's My Eternal King is a classic piece of church music that should be a part of every church choir's library!